Readiband is equipped with a lithium-ion rechargeable coin cell (type PD2430) battery. 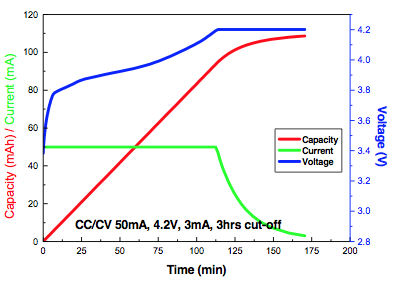 The nominal capacity of the battery is 100mAh, and the nominal voltage is 3.7 V.
Readiband's power consumption is about 38 μA when it's idle and 48 μA when it's recording. The consumption while activating the display and transmitting data is about 10 mA. A fully charged new Readiband should be able to record continuously for at least 6 weeks of sleep data. However, the actual battery consumption varies, depending on how often the user uses the display and downloads data as well as its surrounding temperatures during the assessment period. When the Readiband's battery level reaches 10%, it automatically stops the recording session and changes its status to idle. It will also disable the real-time effectiveness score on the display. Once the recording session stops, it cannot be resumed. It takes approximately 60 minutes to fully charge the Readiband's battery.